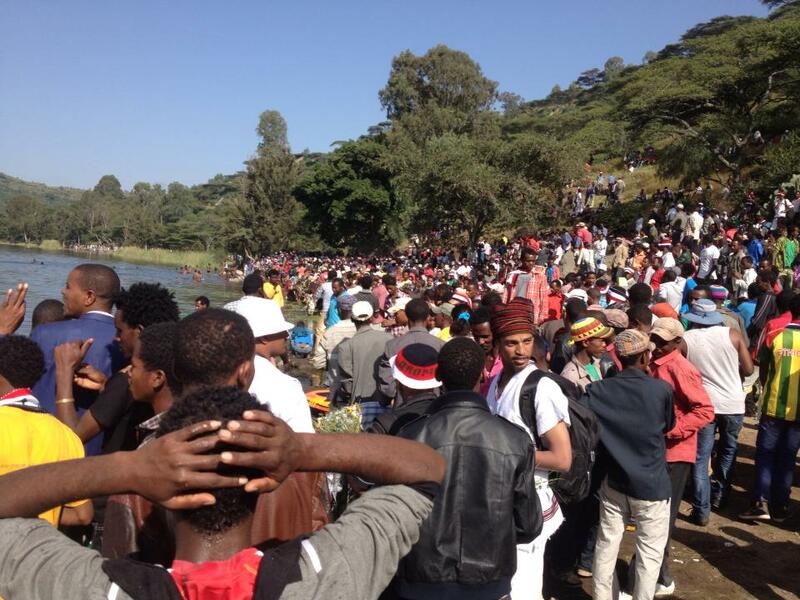 (OPride) – The 2013 Irreecha, Oromo thanksgiving holiday, was joyfully celebrated over the weekend with millions of people flocking to parks and riverbanks around the world. Irreecha or Irreessa marks the beginning of a new lunar calendar and a seasonal change from winter to spring. In Oromia, the Oromo homeland, winter is a busy and muddy season making travel and social life difficult. Spring (booqa birraa) ushers in a new beginning as rain eases, river levels drop, flowers blossom, and newly budding leaves prop to life. During this season, mother earth wears the green gowns of natural beauty – Irreessa or Kelloo. 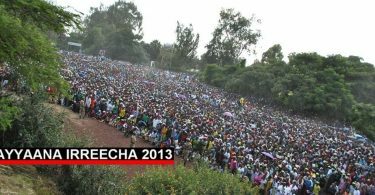 But today, Irreecha has been revived and signifies much more than a seasonal change for the Oromo people. 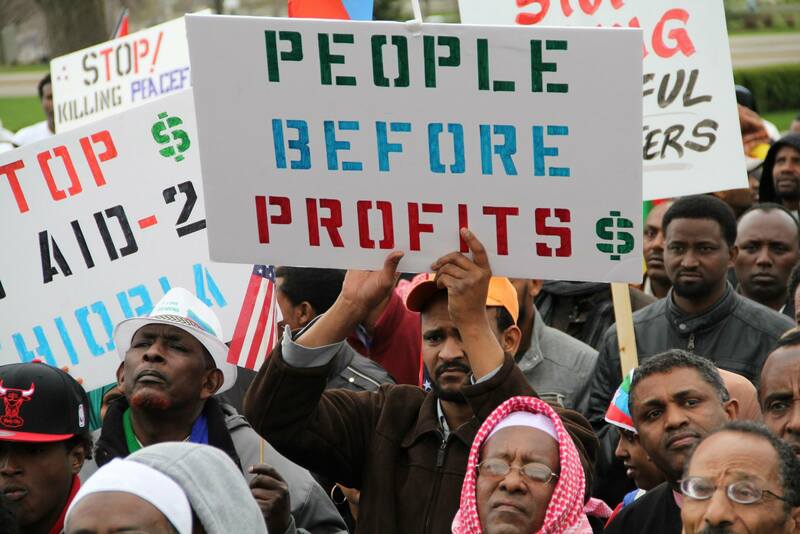 It is a symbol of rebirth as well as resistance against Oromo’s continued repression. 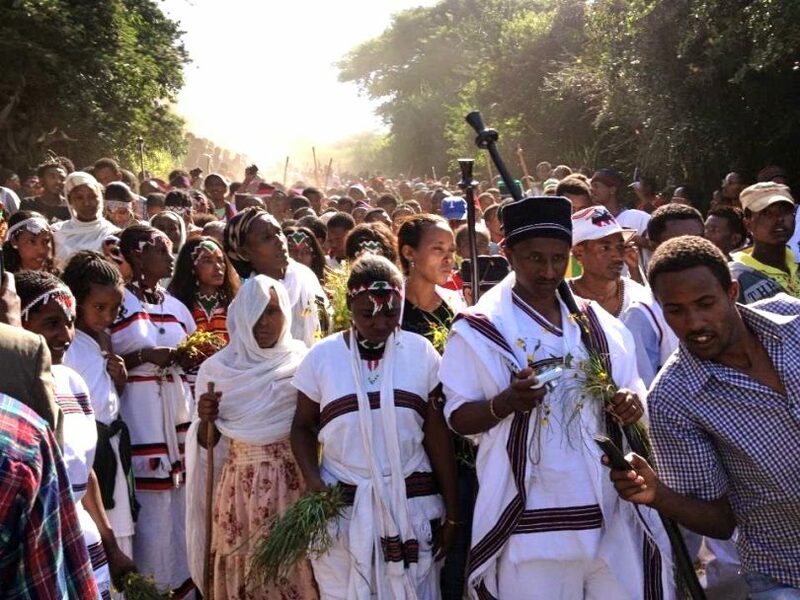 Each year millions of Oromos – from all stripes and religious persuasions – gather at Hora Arsadi in Bishoftu, 50kms southeast of Finfinne (Addis Ababa), Ethiopia’s capital to rejoice and celebrate Oromummaa. 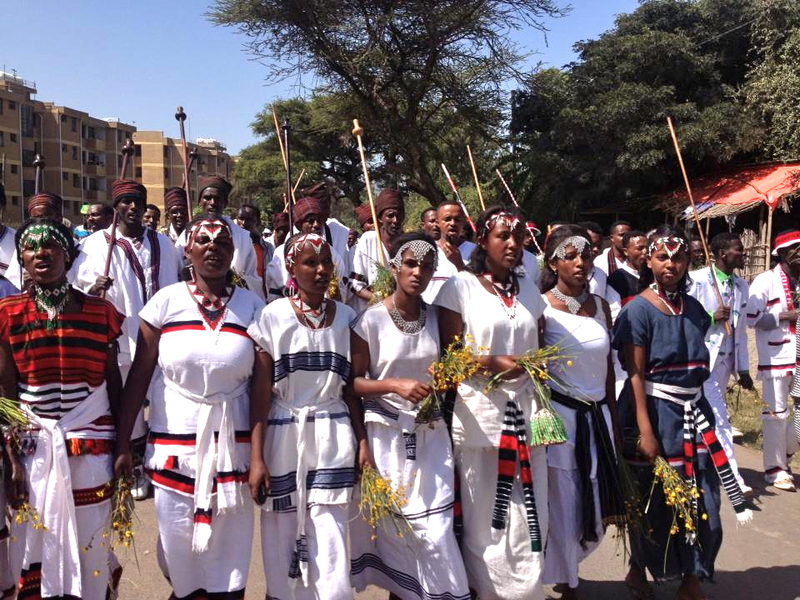 Beyond its traditional religious significance, which is curtailed due to the government’s ban on Waaqeffanna associations, Irreecha serves as a unifying cultural practice for the Oromos without losing connection to Waaqa.An estimated two to three million people from around Oromia attended this year’s festival, according to media reports. Despite heavy police presence at the lake, eyewitnesses told OPride, the Irreecha celebrations and related festivities, including a concert in Dukem town, were orderly and peaceful. Over the last weekend of September, thousands of Oromos – from Washington D.C. to San Diego, Castro Valley in California to Minnesota, Johannesburg in South Africa to Amsterdam in Holland to name but few –danced, ululated and gave thanks to Waaqa for a smooth transition to a new season and the abundance that comes with it while also praying for nagaa (peace), bilisummaa (freedom), tokkummaa (unity), and araara (reconciliation). At the Footscray Park, slightly damp green and evenly trimmed grass rose an inch above the ground. The morning’s mild wind propelled the leaves of various trees from left to right graciously. The Ixora and Bogenia shone brightly to reflect the onset of spring and the Footscray River stayed calm as if unaware of the activities around it. South American drummers beat their drums uninterrupted, a group of Africans fried tender BBQ, and others simply basked in the sun while a curious few joined in the Irreecha festivities. Much of the park’s cosmos maintained its disorganized balance but the hearts of Oromo Melbournians beat erotically with excitement – as if the auspicious day was a therapy for their trauma for the loss of home, culture, and ways of being. The green park was covered by the rainbow color of Oromia’s dress codes. Children run around showing off their Qoloo and Callee while women’s beads sparkled from their necks and foreheads. Men superbly dressed in Kumaala and Bullukko (top wears) holding Bokkuu decorated in the colors of Faajjii Walaabuu. Women holding their Siinqee and Coqorsa (a bunch of thick untrimmed grass) led the crowd to the riverbank whilst chanting songs of prayers and thanksgiving. The crowd followed by repeating the chorus slowly behind. Once at the pointed creek, the elders explained the official Irreefanna procedure. This involved elders from the Borana tribe; the Hangafas led the awaiting crowd with Eebba or blessings. Everyone dipped the Irreessa inside the water as the prayers went on. The elders later explained, while dipping this grass in the water, one’s heart and mind has to forget worldly evil and focus on the good. This was a tender moment of forgiveness, thanksgiving, and gratitude for the bounties of Waaqa. “Baga furda (bacaqii) gannaa baatani booqa birraa argitan, akkasuma kan hortani horaattan mara wajjiin saddeetni sadeetaatti isiniif haa naannawu .” This roughly translates to Merry Spring and thanksgiving. May Waaqa bless your wealth and belongings throughout the Gadaa cycle. Once Irreefanna was done, the Oromo traditional banquet such as miciirra/shakaka, caccabsaa, marmaree, Daadhii (homemade honey wine) were shared. The BBQ chops replaced the sheep that would be slaughtered in Oromo homes or festival places such as Hulluqqoo in Borana and Hora Arsadi. Freshly roasted coffee filled the air and ushered in the Ragadaa, Shaggooyyee, Tirrii and Dhiichisa songs from around Oromia. Far away from Oromia, the Oromo diaspora community eagerly expressed their longing for home in the best way possible. This was their way of saying: Aadaa bareedda qabna hin jiru ka keenna gituu, seenaa bareedda qabna hin jiru ka keenna gituu…yaa Oromoo kumnillee hin bitu. *The writer, Sinqe Wesho, is a Melbourne-based human rights activist and former public relations officer for the Australian Oromo Community in Victoria. She can be reached for comments at arfasabill@yahoo.com.au. Cover photos courtesy of Murteessaa Guutuu Gannoo via Facebook.